NOTES: Advantages: Well detailed, massive improvements made, contain different parts to make either NX or NCC-2000. Disadvantages: Aztec decals separate, instruction does not denote which parts (NX or NCC) is which, different colors means you need to plan ahead and still slight misfit issues. Space, the final frontier. These are the voyages of the starship Enterprise, its five year mission, to explore strange new worlds, to seek out new life and new civilizations, to boldly go where no man has gone before. Of all the Federation starships, one of the most beautiful has to be the Excelsior. Known as the “great experiment” in trying to break the warp barrier, it was never successful. The embarrassment caused her to be mothballed for at least two years while the admiralty board decided what to do with her. Finally, cooler heads prevailed as it was decided although the experiment was a failure, the design of the ship itself was sound and the ship was converted with conventional warp drive engines and gave great years of service. In fact, the original NCC-2000, under the command of Captain Hikira Sulu, was instrumental in bringing peace between the Klingons and the Federation when it was she that was first caught in the Praxis explosion and then, along with the Enterprise, protect the peace conference at Khitomer. In fact, after the decommissioning of the Enterprise-A, the next Enterprise in line, the Enterprise-B was a slightly modified Excelsior. The ship soon proved to be a workhorse for the Federation. Doing everything from yeoman duty, deep space exploration, cargo hauling and patrolling the Romulan neutral zone. In fact, several of the ships were heavily involved in the Tomed Incident, the end result which caused the reclusive species to not appear for several decades. By the time the Enterprise-D entered services some 80 years later, the Excelsiors were still in service such as the Hood, Potemkin, and the Gorkon. In fact, due to the drain on resources by the Dominion War, the Excelsior, heavily modified with improved phasers and the ability to fire quantum torpedoes, also saw service in the war, almost 100 years after the Excelsior first entered service! It was only after the war was over that the tired ships was finally decommissioned. Overall, her service spoke for itself, fully nullifying her initial embarrassment and failure. The original kit of the Excelsior was released in 1995 under the AMT/Ertl brand. I used to have that ship and well, it didn’t turn out too well. Not only were there detail mistakes, the most prominent has to be the ridges along the saucer edge and also the too slanted secondary hull, but also, the fit was atrocious with wrong color call outs. Warp some 20 years later. Now that Round Two has released this new version, what are the differences? Well, they are many and most of it should put a smile on a Trekker modeler face like me, and you know what, I was grinning from ear to ear when I opened the box. The box is your standard Star Trek box that is now prevalent with Round Two. Not too big, unlike the original release, which is twice as big as this and is packed full of parts, which is not that many. Most Star Trek models, unless you jump the shark and dive into the deep end with the two (we will pretend the “Star Trek: Enterprise” NX-01 does not exist here) 1/350th scale Enterprises here, are the simplicity of easy. This kit is no different. In fact, I can count only about 20 or so parts in the box, and some of them are left out since both versions of the Excelsiors are included. Speaking of the two Excelsiors, the reason why this is possible is not only due to the advancement in molding technology, but also the fact the original model itself, which this kit copies. Like the original filming model, the back of the saucer, where the impulse crystal is, is sunk just enough that when it came time to modify it into the NCC-2000, a plate was all it needed to cover it up. This is reflected in the kit. The NX-2000 impulse crystal was molded onto the kit and sank a little. To modify it into NCC-2000, a back plate was added on, then two of the smaller impulse crystals can be attached to create the differences. The next difference is the bridge, two bridge pieces are included to create either version with finally, the shuttle bay difference included in two different pieces. The only unfortunate thing is that these parts are not explained in the instructions so you need to study the back of the box carefully and remember the difference before attachment. Details are extremely good. One thing that this kit corrected is the correct saucer edge, without the ridges, the other is the correct slant of the secondary hull front. One detail that is missing are all the ridges on the secondary hull from the first kit. At this scale, it’s not there and it’s not missed. In fact, look closely at the shuttle bay parts, the thing that juts out, they are 1/1000th scale shuttle crafts molded integral on the landing platforms! So yes, you can indeed drill out the shuttle bay doors and display them if you wish. Also, included in the kit is a clear navigational deflector back plate that is missing from the original kit. The other serious issue this kit corrected is the fit and misalignment issues of the original kit. 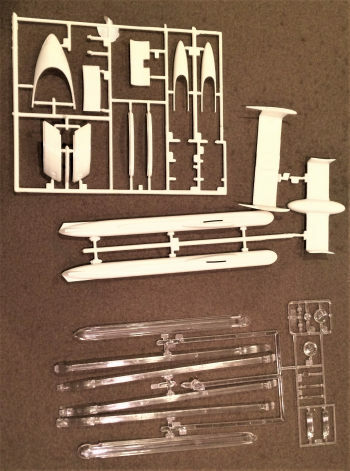 In the original kit, the secondary hull was separated into three pieces, with a top piece, the bottom piece and the rear end piece. The top and bottom especially had only four measly small guidance tabs that doesn’t secure the hull worth a damn and not only left a nasty gap, but also create serious misalignment issues if you are not careful! This time, this not gonna happen as the rear hull plate is molded integral with the rear hull and six huge plugs are on the top of the hull plate spread evenly along the bottom. In fact, these plugs and their holes are so tight, the secondary hull is a snap fit. Don’t even bother trying to test fit. It is not needed for one, and second, I tried, and it turned out, they held on so tight, I had one hell of a time trying to separate them and almost broke the rear end piece right off! So no don’t bother cause these six plugs ensure a nice even fit without any misalignment issues. In fact, I would go as far as say, if you somehow misalign this, then you are a total idiot! Also, before I go, notice the navigation deflector dish housing, this piece used to be separate and created a nasty seam to fix when attached. This time, it is molded integral to the secondary hull! No seam to correct whatsoever! The single decal sheet is basically complete except for the Aztecs. They are separate….Sigh, well, guess Round 2 has to get their money from somewhere. I will definitely buy the Aztecs so this model won’t be complete for a while. But other than that, the decals are surprisingly complete! Things that were not included (but should) on the original kit are now, like the strips that run along the top of the secondary hull, RCS thruster lines, and the strips that runs along the saucer edge are now included with stuff that should not like windows (although they are all dark. Wish some of them would be “on”) and markings for the phasers emitters too. Overall, if you want to save $20 and forgo the Aztecs, you could still create one serious beautiful Star Trek model without the Aztec markings. Ohh yes!! To say this was $35 well spent was to say the least! 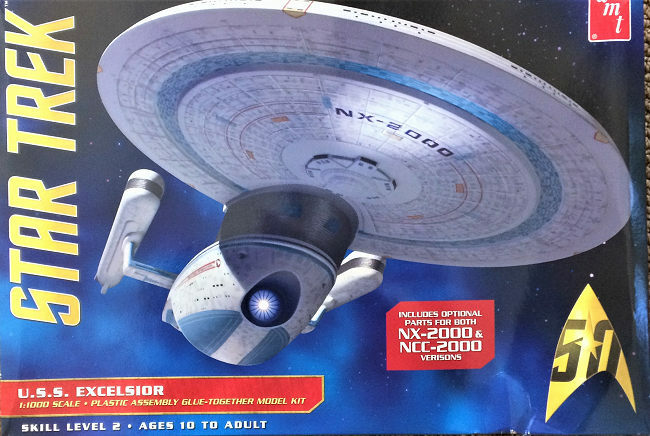 In fact, I’m so happy I’m seriously thinking about buying a second one so I can do BOTH the NX and NCC-2000 Excelsior! The amount of details in this kit is beyond and Round 2 really overdone themselves this time! In fact, the only real complaint that I can find is the rear saucer piece that STILL cause gap and step issues. If Round 2 had fixed that, this kit would’ve been perfect. The rest is just nitpicking and I can just forget them since the rest of the kit is so good. The real treat is the secondary hull. It’s fixed and so well thought out this time that it isn’t really funny just how well it is done! In fact, if Round 2 is thinking about re-releasing the Enterprise-B, I hope they can do something similar to that kits hull since I misaligned the secondary hull there due to the too small and too few locating tabs issue. The fact of the matter is, me and Scott had a discussion on whether or not to pay an extra 10-20 bucks and is it worth it to buy the new Round 2 kits…..The thing is, if this kit is any indication, then the answer is a definite YES! Not only do you get the parts to create either the NX or NCC version, but also, the details, the MASSIVE improvement to the secondary hull and clear parts are more than worth the extra costs. The only thing missing for me is if they added the Aztec decals to the kit and charge it for more, I would pay it. But then again, I understand the choice as excluding it keep the price down and allow non-trekkers to buy and enjoy a great model at an affordable $35 price while a serious trekker modeler like me can pay the extra to get the Aztecs to create a stunning Star Trek model! Either way, it’s the modeler who wins. Seriously, go out and get this kit. You won’t be disappointed!